The mark of a true leader is clearly identified in their character. Titles and positions will only take you so far. Character takes you the distance! In this REFlections interview, I had the privilege of interviewing a brother and leader with proven character. To modify John Maxwell’s quote above, this leader knows THE WAY, follows THE WAY, and shows others THE WAY. On public platforms and behind-the-scenes, this man of God serves selflessly and cares deeply about our generation. Chris Estrada is the Director of the Youth Major at Christ for the Nations Institute (CFNI) in Dallas, Texas. In this capacity, he has been afforded the unique opportunity to pour into leaders and pastors from around the world. 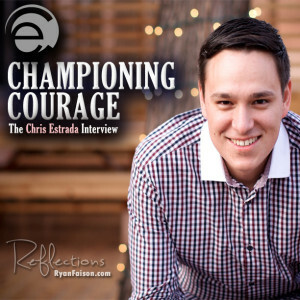 Chris has also been entrusted to host the National Youth Leader Experience (see link after interview), taking place this weekend (starting April 25, 2014). Chris has extensive experience in pastoral ministry, business and mission work. In this interview, it is my prayer that you hear the words of encouragement, conviction and wisdom from a friend I truly admire. REF: What does a day look like in the life of Chris Estrada? Chris: Everyday looks different and serves as an opportunity to journey with God. Among the traveling my wife and I do yearly, we lead a small group for leaders and pastors in our local church. I don’t want to be one of those traveling ministers that don’t have a footprint in the local church. All roads lead to the local church. I’ve learned that even with planning out my day (I’m a planner), I need to take time to reflect and praise God for what He’s done in an event or gathering before moving on to the next thing. REF: What advice would you give leaders about valuing family? Chris: Ryan, man…I actually learned it through a hard lesson. I went through a situation when my senior pastor made poor decisions in light of his wife’s sudden heart attack. The church was attempting to reclaim its footing after the leader made these bad situations. I learned that there were people who would say (speaking of me), “Pastor Chris will always be there for you.” However, I knew I needed to be there first for my family. At that season of our lives, we neglected our family. While others were at family BBQs, we had to be at a church. If were at a birthday party, we could only stay an hour because we had a leader meeting at church. Now, being on staff at CFNI, I am free to say to others that I can stay for only an hour at an event or gathering because I have to go be with my family. My family is incredibly important. Nothing trumps my wife and children. I will tell my wife, “If you are not enjoying your life because of something I’m doing or involved in, I will shut it down.” I have no problem stopping what I am doing. My ego is not attached to what I do. I can go back into corporate America or the business world and win my co-workers to Christ. I don’t need a stage and mic to do that. I am not an absent dad. You will not see me opening my laptop at home with family and rarely will I text or talk on the phone after 5 PM (unless you are Ryan – LOL)! REF: If you could describe yourself in one word, what would that word be and why? Chris: I would probably use the word courage. I’ve always been the least qualified or lacking any qualifications to do what I do. I don’t know how I got the wife that I got (it took courage)! Sometimes, I don’t even know how I got in the rooms I got in or developed the relationships I have today. It took courage and not feeling insecure in the shadow of their great ministries or influence. My lifelong battle has been to stay encouraged. Even when facing hard times as a man, husband, father and servant of God. It takes courage to move forward. Our ministry’s motto is: Releasing courage and power to risk takers & dreamers who want divine turnarounds. That’s who we are and that is our message. We are constantly taking risks and if it doesn’t require courage, we don’t do it. I rather fail and still have courage than have need of it. REF: Chris…Pastor Andy Stanley was quoted saying, “A single act of courage is the tipping point to extraordinary change.” So, what act of courage have you implemented that encouraged you to live this life of courage? Finally, I worked up enough courage to wash his feet and then to have to wash hooves! MAN! As I started to wash his feet, he complained that the water was ice cold. I apologized for the temperature and began to rub his feet. I watched firsthand clear water turn black-gray from the grime on his feet. I will never forget this — God led me to pray for this man as I was washing his feet. I was led to pray for his marriage that was heading for divorce. I sensed he was deeply concerned about how his sons will respond to it and prayed that he would never lose his fatherly voice in their lives. I prayed that what God put together no man would be able to separate. I prayed that he would find the courage to make changes and draw close to God. I remember as I prayed, this huge man who was big and imposing began to weep right over me. It was in that moment I realized that people need courage. Ever since, I’ve been known to take courageous steps. My family lives by courage. My kids live with courage. My daughter courageously prophesied over a woman who was clinically depressed (and she didn’t have previous knowledge of her condition). I watched my son minister to a man who had a great gift of singing but thought he was going to die prematurely. My son knew this man (a waiter) was tormented by the early death of others in his family and was in the music industry (my son would have never known that). Courage is needed in whatever you do. You can never overdose in courage! REF: How do you believe God is using you to infuse the value of courage in the next generation of leaders, especially in your role at CFNI? Chris: People believe there are not good leaders due to a lack of trust. Poor views of leadership in government and society bleed into the Church. You have many who will question their spiritual leaders’ motives and agendas. But, I believe the lack of trust in leadership is due to not liking the environments they are in. They may be looking for a perfect environment. Ryan, I’ve been in hundreds of churches and know a great number of pastors and leaders. You are not going to find a perfect environment. You are not going to find perfect people. It is essential to beseech people and leaders to be as unoffendable as possible. Our feathers are too easily ruffled. Our feelings are too easily hurt. By no means is this a license to be insensitive. But, we must learn to bear with one another and a heart to bring the best out in others. My chief job in life to bring out the best in my wife. It is the same with kids, my staff and my students. I am a gold-digger. I am searching for the gold. I understand that in order to find the treasure, I must dig through the dirt. But, my focus is never the dirt, but the gold. When you have this mentality, you are ready to go through some misunderstandings and miscommunication. As leaders, you live in a glass house. It is important that we understand our humanity while demanding integrity. Ryan…this generation of leaders have much charisma, but character is too often lacking. I say this because I am young. I’ve never had a problem with others not trusting me because I follow through with what I’m going to do. If I can’t do something, I say something. It is a character issue. When I started at CFNI, I was 27 and I’m overseeing a bible college with over 1200 students from all over the world. Why would they trust a 27 year old to run that? It is an integrity issue. I don’t want to see people in their dysfunction but their destiny. This is why Jesus can see the prophet in the pervert and the apostle in the addict! I’ve heard some preachers say how they have a problem with some titles given to Bible narratives such as “the woman with the issue of blood.” This was her dysfunction, not her destiny. We must see people in their destiny — it’s easier said than done. It is easy to limit others to their dysfunction. But, we must build our spiritual muscle to forgive easier, to overlook and keep going. REF: How does this philosophy of ministry help you in leading and serving at CFNI? Chris: Dude, I get many who say that the students we receive at our school are the church’s best of the best. But, you will be surprised to know the struggles they contend with such as homosexuality, addictions and other potentially disabling issues. We are here to train generals and “polished arrows”. But, the Lord sends us the broken to serve the broken. Give us the Gideons, give us the Davids — seeing a king in a shepherd boy. Even with the struggles, we call out destiny and ensure the goal is clear. Too often, we are destination conscious. Destiny is not where you end up but who you end up becoming. REF: One last question Chris and its personal…What do you enjoy doing? Chris: I’m Hispanic so I love to eat! My trainer doesn’t like it, but I love good food. I love good laughs. I love basketball. I play ball every Monday (I might play tonight)! I like being alone too. Don’t get me wrong — I love people, but I yearn for the quiet moments. With 3 kids screaming in the back, I like the peace and quiet. I love plane rides and love to read books. I’m a 6, 7, 8 books-a-year guy. But, Ryan — I do read my Bible and that takes much of my time!! I love seeing people “get it” especially when it comes to identity. When people know who they are, they understand what they are called to. NOTE: In this moment, Chris spoke personally into my life from the Scriptures by the prompting of the Holy Spirit. Chris is a leader God is using to speak life and destiny into the lives of people — including this interviewer! Thank you Chris for your heart, ministry and brotherhood! Pursuit NYC Podcast Available Now!